The German Messerschmitt Bf.109E fighter (no. 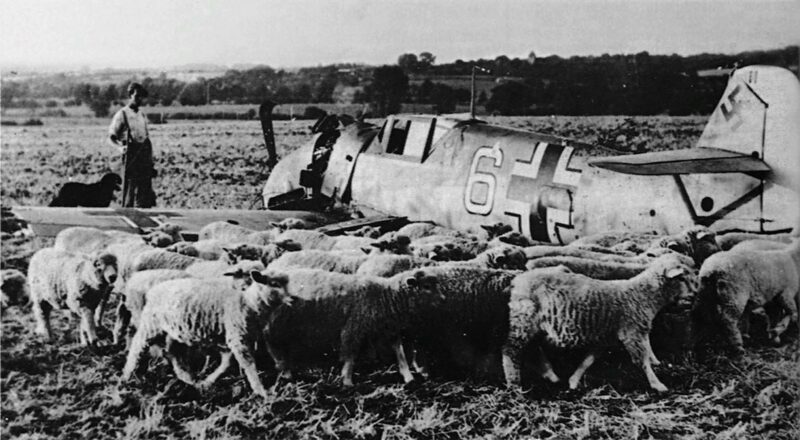 1985) by pilot Lieutenant Heinz Schnabel from 1./JG3 squadron of the Luftwaffe was shot down by British fighters and made an emergency landing on September 3, 1940. The pilot was captured and held in an English prisoner-of-war camp No. 15 in the village of Shap (England) in a former hotel. On November 24, 1941, Lieutenant Heinz Schnabel, together with another prisoner of war, Harry Wappler (pilot of the Heinkel He-111 bomber from KG27), made one of the bravest escapes in the history of the Second World War. Having gotten into the airfield of the RAF Kingstown, they managed to get the English training plane Miles Magister with the help of ground support personnel. Having refueled at another airfield of the Royal Air Force, the German pilots headed for Holland, but flew only to the English city of Great Yarmouth, where they were caught and sent to the RAF Horsham St Faith airfield. After that, they were returned to the camp in Shap, where they were punished with a 28-day stay in solitary confinement.